For our 200th post, Dad is holding down the fort while Mom travels to Michigan for a conference. This is my first time caring for Matilda for 24 hours by myself. Well, 57, but who's counting! And this is Kristin's first time being away from Matilda for over 5 hours. 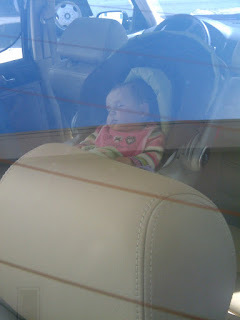 Matilda's taking a nap after we've dropped off Mom at the airport. I think I have the better deal.